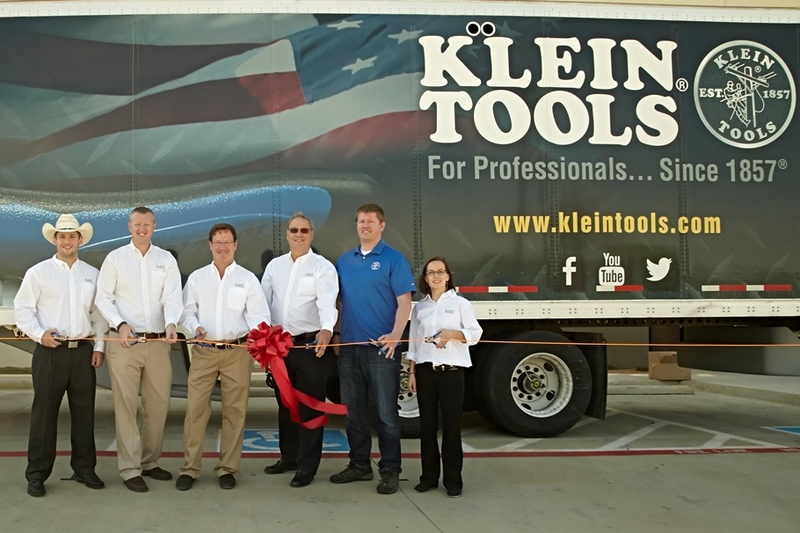 Last week was a very exciting week here at Klein Tools… it was the Grand Opening of our 8th U.S. manufacturing facility! On April 10th, we cut the “ribbon” at Klein Tools’ new Heat Treat facility in Mansfield, TX. This 60,000 square foot facility houses all the necessary equipment to, as the name suggests, heat treat Klein Wire Cutting and Stripping products (e.g. pliers, wire strippers). Of course, our ribbon was actually a Klein fiberglass fish tape and we used our high-leverage linesman pliers to do the cutting. It was truly a great day! Several members of the Klein family (fifth and sixth generation!) were there to actually cut the ribbon, plus the employees of the new facility and many local dignitaries. Most importantly it gave us an opportunity to reinforce Klein Tools’ commitment to U.S. manufacturing. U.S. manufacturing is something Klein has been diligent about in its 157 year history, and this new facility is a representation of the millions of dollars of investments that Klein Tools has made over the last 10 years to continue that commitment. These investments are meant to expand Klein Tools’ manufacturing in the U.S., but also to advance the methods and processes that go into making our tools. A great example of that is Klein Tools’ Manufacturing HQ, which is just down the street from the new Heat Treat facility. That’s where we machine and finish our pliers, wire strippers, and many other products. Investments in new machinery and technology here has allowed Klein Tools to be more efficient in production while still maintaining a high level of precision throughout the entire manufacturing process. Later this year, Klein Tools also plans to break ground on a brand-new 175,000 square foot manufacturing facility right next to the Heat Treat plant in Mansfield. These three plants are in addition to the six other manufacturing facilities Klein Tools has in the U.S. – Turn-Key Forging in Elk Grove, IL; Klein Plastics in Rockford, MI; Klein Cutlery in Bolivar, NY; Klein’s canvas and leather goods plant in Fort Smith, Ark. ; Klein’s worldwide Distribution Center in Cedar Rapids, IA; and Corporate Headquarters in Lincolnshire, IL. Klein Tools manufactures more SKUs of tools used in electrical applications here in the United States than any of our competitors. Like most global companies, we do source some products abroad, but Klein Tools makes 14 times more products here in the United States than we do in any other country. Also, Klein’s global expansion has opened the door for us to sell USA made products in other parts of the world. In fact, at the present, we export more US-made product to other countries than we import from other countries. The bottom line is this: All Klein products, regardless of where they are made, are carefully designed and quality-tested to ensure they meet our very high standards. Klein Tools’ mission is and will continue to be, supply the American worker with the best tools available anywhere in the world and manufacture these tools in the USA whenever possible.